In assisting those with less than perfect credit, I often have clients who are drowning in debt. The debt is so overwhelming that many bills haven’t been paid. Some have even been sent to collections. You can go through a process called Debt Settlement. In short, it’s when you offer the credit card company a one-time payment that’s more than your regular payment, but less than what you owe. Depending on the company, this can be as low as 25% of your debt. 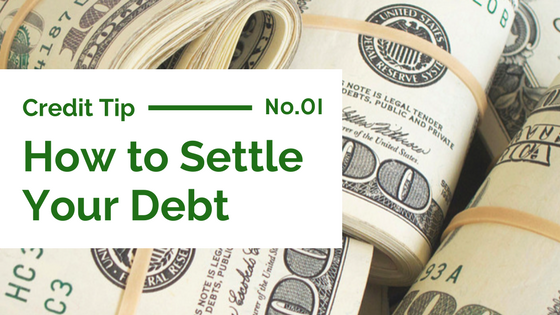 How do you settle your debt? First: Make sure the debt is yours by requesting a Debt Verification/Validation Letter. You can request one verbally or by faxing/mailing a letter to your creditor. Second: Make sure that the debt is not past the Statute of Limitations and now considered Zombie Debt. According to Forbes, Zombie Debt is debt that is years old — often past the statute of limitations for you to be held legally responsible — and it is entirely owned by a debt collection agency. The statute of limitations begins calculating the last time the debt was active (i.e., last time credit card used). DO NOT agree anything on the phone until you get your Debt Verification / Validation Letter and can confirm the debt is not Zombie Debt. You want to avoid accidentally reactivating the Statute of Limitations by agreeing to make a payment. If a creditor contacts you about Zombie Debt, although you still owe the debt, they cannot legally collect it as long as you have proof that it’s past the statute. Your proof can be found in the Debt Verification / Validation Letter that you should request from them. Third: Try and reduce the balance of your debt to as low as possible. The debt collector bought your debt from the original company you owed and probably paid pennies on the dollar to buy it. Because of this, debt collectors will often take less than you owe if you negotiate. Call toward the end of the month to take advantage of the quotas many collectors must make before the new month begins. Start low by offering to pay 30 percent or less of what you owe and negotiate your way to an amount that you and the collector can both agree upon. Make your offer attractive. If you’re going to ask that they settle for 70 percent off of what you owe, you should pay it in a lump sum payment. Asking for a steep reduction of your debt as well as a payment plan, is not likely to work in your favor. Fourth: Ask that they DO NOT report your agreement as settled on your credit report (this is VERY BAD and to avoided if possible). Instead, ask that they report it as, “paid as agreed upon.” Also ask if they can erase the tradelines associated with the debt. Tradelines are just the account and its history on your credit report. Tradelines can take up to seven years to drop off your report, so getting rid of negative ones early is beneficial. Your creditor may or may not agree to do so, but it’s worth it to ask, especially if you’re planning on paying a lump sum. Fifth: Know that you may have to pay taxes on the amount that your creditor(s) excused as a result of your awesome negotiation skills. Uncle Sam views “excused debt” as income and wants his cut. You can avoid this by shaving off no more than $600 on the debt you owe. Anything above that amount will be reported and taxed. Be smart. It may be worth it to pay the taxes on the amount of debt that you don’t have to pay, if you can dramatically reduce what you owe. Sixth: If your creditors agree to the terms above, MAKE SURE TO GET IT ALL IN WRITING BEFORE MAKING A PAYMENT. This way, if they don’t honor what you both agreed upon, you could use what they sent you in writing as proof. You’ll also need it if you want to make corrections to your credit report, should your creditors report you incorrectly. You’ll see your credit score rise as a result of reducing your debt. It will jump even higher when you pay off the debt you’ve negotiated down. Thirty-five percent of your score is based upon how much debt you have in comparison to your income. To continue on the path of better credit, once you have settled all of your past due debts and are able to pay all the rest of your debts on time, sign up for credit restoration services at: bit.ly/CreditFixNOW.